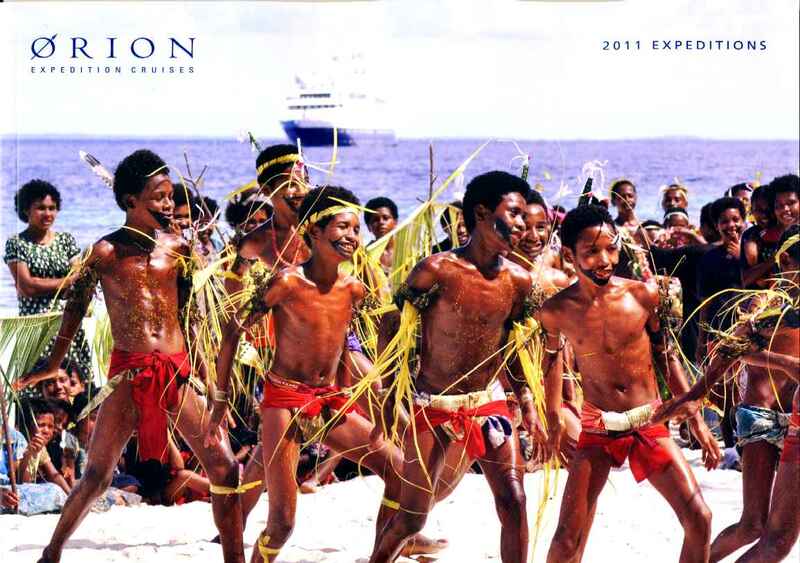 Orion Expedition Cruises has just released its new, expanded, 2011 Expeditions brochure, which features the company's two ships, Orion and (to be introduced in May 2011) Orion II. The 94 page brochure covers 49 voyages to 17 countries and more than 170 remote and exotic destinations stretching from Antarctica to the Russian Far East. Destination summaries by region provide useful reference for potential expedition travellers and highlight the differences between typical mainstream cruising and the rewarding physical and intellectual experiences to be had on Orion's luxury small ship expedition voyages. "The introduction of Orion II to the fleet in 2011 has inspired us to present our range of exciting year-round expedition cruises within a quality photo-image format to best portray our varied destinations and 5 star ships. Expansive landscape photography reflects seascapes and cultural interaction typically encountered on Orion expeditions and the expanded range of 27 different itineraries provides plenty of choice for potential guests". "Orion's ecologically and culturally sustainable expeditions provide authentic experiences in remote and seldom visited destinations. Onboard lectures and shore-side interpretation by our expedition team allows our guests to absorb the surroundings and cultures unknown to mainstream tourism", commented Sarina Bratton, Managing Director of Orion Expedition Cruises, when announcing the release of the new brochure. The luxury life onboard is revealed through Orion and Orion II's range of accommodation and facilities, (including floor plans for Staterooms and Suites through to Owner and Penthouse Suites) and examples of onboard facilities that include boutique, massage, spa, elevator and lounges – and Serge Dansereau's award winning cuisine. The brochure has a useful pricing supplement with early booking incentives, rewards and notes on how to reserve your Orion Expedition. If a photo tells a thousand words then video goes one better. The brochure also contains a DVD providing a taste of some of the destinations visited and typical cultural, historic and wildlife experiences encountered along the way. Orion II's inaugural voyages in 2011 include the Russian Far East, an in-depth exploration of Borneo, Vietnam, Thailand and Cambodia (including a visit to Angkor Wat, the world's largest religious monument), and the Inland Sea of Japan. Orion's itineraries feature 13 voyages exploring Australia's Kimberley coast, the rarely visited indigenous art centres of Arnhem Land, and a voyage to the Spice Islands. Voyages to New Zealand and the Sub Antarctic islands will include the rarely visited Chatham, Antipodes and Bounty islands, while Orion's Papua New Guinea itineraries feature an exciting new voyage across northern Papua to West Papua and Maluku. An electronic version of the Orion 2011 brochure can be downloaded from www.orionexpeditions.com/ebrochure or a printed version mailed directly simply by contacting Orion Expedition Cruises: 61-2 9033 8777 (Sydney callers) 1300 361 012 (regional and interstate), emailing info@orioncruises.com.au or through specialist expedition cruise travel agents. All prices per person, twin share. 5 nights Great Barrier Reef / Orion: Fares from A$3,715 for an ocean view Category B stateroom; A$5,125 for a Junior Suite; Owners' Suites with French Balcony are A$7,780. 7 nights Gulf of Siam Explorer / Orion II: Fares from A$5,705 for an ocean view Category B Ocean Suite; A$7,910 for a Junior Suite; Penthouse Suites with Balcony are A$11,480. 10 nights Inland Sea of Japan /Orion II: Fares from A$8,150 for an ocean view Category B Ocean Suite; A$11,300 for a Junior Suite; Penthouse Suites with Balcony are A$16,400. 10 nights Kimberley Expedition / Orion: Fares from A$9,100 per person for an ocean view Category B stateroom; A$12,550 for a Junior Suite per person; Owners' Suites with French Balcony are A$19,055 per person. All prices twin share. 14 nights Ryukyu Islands and Sabah /Orion II: Fares from A$11,410 for an ocean view Category B Ocean Suite; A$15,820 for a Junior Suite; Penthouse Suites with Balcony are A$22,960. 18 nights Mawson's Antarctica / Orion: Fares from A$19,365 per person for an ocean view Category B stateroom; A$26,710 for a Junior Suite per person; Owners' Suites with French Balcony are A$40,555 per person. All prices twin share.